Thermal storage in the building sector provides a buffer to balance fluctuations in supply and demand of low temperature thermal energy for space heating and cooling. It is economically inefficient to install production and distribution equipment with the capacity to accommodate for the maximum short-term demand. Also, productivity decreases when production equipment cannot operate at full capacity in periods of reduced demand. Consequently, manufacturing processes will seek to operate at optimum capacity, and store surplus production in periods with less market demand. This principle is, however, not feasible in most of today’s conventional energy production and distribution systems. The basic idea behind thermal storage in the building sector is to provide a buffer to balance fluctuations in supply and demand of low temperature thermal energy for space heating and cooling. The demand fluctuates in cycles of 24 hour periods (day and night), intermediate periods (weekly for example) and according to seasons (spring, summer, autumn, winter). Systems for storing thermal energy (heat/cold) should therefore reflect these cycles, with short term, medium term or seasonal storage capacity. The energy sources normally used for heating and cooling are oil, gas, coal and electricity. However, it is not entirely logical, nor efficient, to burn fossil fuels at temperatures up to 1000 degrees in order to create an indoor climate at 20-25 degrees. Further, burning of fossil fuels emits greenhouse gases. Nor is it efficient to use electric power, a form of highly processed energy, simply for resistance heating. Design proposals have been made for the use of molten salt as a heat store to store heat collected by a solar power tower so that it can be used to generate electricity in bad weather or at night. Thermal efficiencies over one year of 99% have been predicted. AGS - Annualized Geothermal Solar - Involves the capture of heat by isolated solar gain devices rather than the building structure. From here it is deposited in the earth or other storage masses or mediums adjoining the building using active or passive technology. The depth at which the heat is deposited is calculated according to soil type to provide a controlled 6-month heat-return time-lag to the building through conduction as the building cools. ATES - Aquifer Thermal Energy Storage - There are two basic principles for aquifer thermal storage: Cyclic regime and Continuous regime. A plant can also be made with groups of wells instead of just two single wells. With a cyclic regime, cold and heat can be stored below/above the natural ground temperature. Cyclic flow will create a definite cold and heat reservoir around each well or group of wells. It is possible to maintain a ground volume above or below the natural ground temperature all the time. One disadvantage is a more complicated well design and control system with each well being able to both produce and inject ground water. To minimize thermal mixing within the aquifer, the supply and injection wells have to be spaced an appropriate distance apart. The continuous regime can only be used where the load can be met with temperatures close to natural existing ground temperatures. The storage part is therefore an enhanced recovery of natural ground temperatures. Continuous flow is simpler with regard to system design and well control, and only one well or group of well need to be equipped with pumps. The disadvantage is the limited temperature range. A suitable source of low cost thermal energy with a later demand for stored energy. BTES - Borehole Thermal Energy Storage - With borehole storage, vertical heat exchangers are inserted into the underground, which ensure the transfer of thermal energy towards and from the ground (clay, sand, rock, etc.). About a dozen of projects has been completed. Many of these projects are about the storage of solar heat in summer for space heating of houses or offices. Ground heat exchangers are also frequently used in combination with heat pumps, where the ground heat exchanger extracts low-temperature heat from the soil. Sweden (Lulea Technical University) has been one of the pioneers in developing borehole thermal storage. The first project was designed in order to store waste heat from a steel smelter in Lulea, and use it for space heating at the university. The holes for BTES are usually drilled to a depth of about 100-200 meters, using mine drilling technology. The drill-hole diameter is typically 150-200 mm. Each hole is furnished with pipes for inserting and extracting a heat/cold carrying fluid into the hole. There are two basic principles, open and closed, being used to transport the heat carrying medium in and out of the holes. CTES - Cavity Thermal Energy Storage - When warm/hot water is first filled into the cavern, the heat losses to the surrounding rock mass will be substantial. However, during the first year or two after commissioning, the cavern will have developed a stable thermal halo around itself with decreasing temperature away from the warm/hot center. There will still be a loss of heat, but dry rock is a poor heat conductor. The heat loss should be less than 10% during one operational cycle under favorable conditions. A crucial factor is ground water transport through the rock masses in the area, the less the better. Eutectic Point - The melting point of a mixture of two or more solids (such as an alloy) depends on the relative proportions of its ingredients. A eutectic or eutectic mixture is a mixture at such proportions that the melting point is a local temperature minimum, which means that all the constituents crystallize simultaneously at this temperature from molten liquid solution. GCHP - Ground-Coupled Heat Pumps - Probably the fastest growing market sector for heat pumps in residential buildings in North America and Central/North Europe. Such installations can be used both for space heating in winter and cooling in summer, simply by reversing the system. This also incorporates an element of thermal storage. When the system is used for heating, the ground around the heat exchanger(s) will gradually cool down, and may eventually freeze if the heat exchanger is placed in soil. Then when the system is reversed for cooling, the ground gradually warms up, and this heat will be reclaimed during the next winter cycle. Ice Energy Storage - Off-peak electricity can be used to make ice from water, and the ice can be stored until the next day, when it is used to cool either the air in a large building, thereby shifting that demand off-peak, or the intake air of a gas turbine generator, thus increasing the on-peak generation capacity. Molten Salt Storage - A variety of fluids can transport the sun's heat, including water, air, oil, and sodium, but molten salt may be the best. Molten salt is used in solar power tower systems because it is liquid at atmosphere pressure, it provides an efficient, low-cost medium in which to store thermal energy, its operating temperatures are compatible with today’s high-pressure and high-temperature steam turbines, and it is non-flammable and nontoxic. In addition, molten salt is used in the chemical and metals industries as a heat-transport fluid, so experience with molten-salt systems exists for non-solar applications. Molten Salt can be employed as a heat store to retain heat collected by a solar tower or solar trough so that it can be used to generate electricity in bad weather or at night. It was demonstrated in the Solar Two project from 1995-1999. The molten salt is a mixture of 60 percent sodium nitrate and 40 percent potassium nitrate, commonly called saltpeter. It is non-flammable and nontoxic, and has already been used in the chemical and metals industries as a heat-transport fluid, so experience with such systems exists in non-solar applications. The salt melts at 430°F. It is kept liquid at 550°F) in an insulated "cold" storage tank. The liquid salt is pumped through panels in a solar collector where the focused sun heats it to 1,050°F. It is then sent to a hot storage tank. This is so well insulated that the thermal energy can be usefully stored for up to a week. When electricity is needed, the hot salt is pumped to a conventional steam-generator to produce superheated steam for a turbine/generator as used in any conventional coal, oil or nuclear power plant. Molten-salts freeze at relatively high temperatures 120 to 220°C (250-430°F). This means that special care must be taken to ensure that the salt does not freeze in the solar field piping during the night. PCM - Phase Change Material – A PCM melts and takes up energy corresponding to the latent heat of the material when the temperature increases above the melting point. When the temperature decreases below the material's melting point, the PCM solidifies (freezes) and the latent heat is released. Phase change materials can therefore be used as a thermal storage medium for both heating and cooling. Includes: Ice Storage, Snow Storage, Paraffins and fatty acids, Salt hydrates and eutectic mixtures. Some of the more popular and easy to use products are various paraffin and these can be made with melting points between - 20o C and 120 o C. Paraffins are non-toxic, ecologically harmless, and chemically inert to nearly all materials, and this means that there will be no corrosion in heating/cooling systems. PAHS - Passive Annual Heat Storage - Solar heat is directly captured by the structure's spaces through windows and other surfaces in summer and then passively transferred by conduction through its floors, walls and roofs into adjoining thermally-buffered soil. It is then passively returned by conduction and radiation as those spaces cool in winter. Low-Temperature Systems - Use the soil adjoining the building as a low-temperature seasonal heat store (reaching temperatures similar to average annual air temperature), drawing upon the stored heat for space heating. Such systems can also be seen as an extension to the building design (normally passive solar building design), as the design involves some simple but significant differences when compared to 'traditional' buildings. 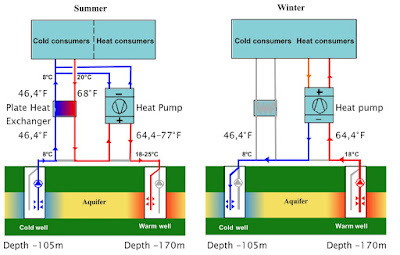 Warm-Temperature Inter-Seasonal Heat Stores - Also use soil to store heat, but employ active mechanisms of solar collection in summer to heat thermal banks in advance of the heating season. Warm-temperature heat stores are a development of low-temperature stores in that solar collectors are used to capture surplus heat in summer and actively raise the temperature of large thermal banks of soil so that heat can be extracted more easily and more cheaply in winter. 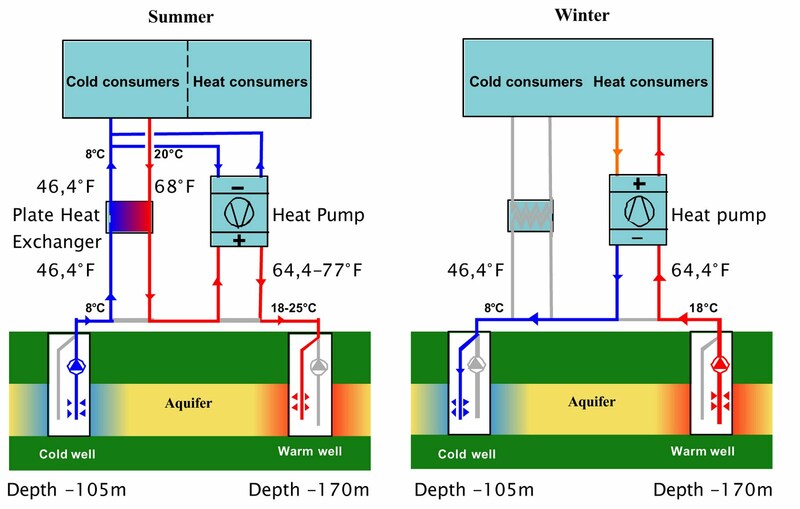 Inter-seasonal Heat Transfer uses water circulating in pipes embedded in asphalt solar collectors to transfer heat to Thermal Banks beneath the insulated foundation of buildings. A ground source heat pump is used in winter to extract the warmth from the Thermal Bank to provide space heating via under-floor heating. A high Coefficient of Performance is obtained because the heat pump starts with a warm temperature of 25°C from the thermal store, instead of a cold temperature of 10°C from the ground. High-Temperature Seasonal Heat Stores - Essentially an extension of the building' HVAC and water heating systems. Water is normally the storage medium, stored in tanks at temperatures that can approach boiling point. Phase change materials (which are expensive but which require much smaller tanks) and high-tech soil heating systems (remote from the building) are occasionally used instead. For systems installed in individual buildings, additional space is required to accommodate the size of the storage tanks. STE - Solar Thermal Energy - Thermal energy storage for solar thermal power plants involves heating synthetic oil or molten salt using solar energy. Once the substance heats, it can support electricity generation during cloudy periods and up to ten hours past sunset. Solar thermal power plant builders have demonstrated one project at the AndaSol One facility in Spain. Applications for additional plants are pending in Nevada and California. Thermal Bank - A bank of earth used to store heat energy collected in the summer for use in winter to heat buildings. A Thermal Bank is used to store warm temperatures over a very large volume of earth for a period of months, as distinct from a standard heat store which can hold a high temperature for a short time in an insulated tank. UTES - Underground Thermal Energy Storage - Stores available energy within the subsurface of the earth ground or groundwater) for heating and cooling applications. UTES has been used to store large quantities of thermal energy to supply process cooling, space cooling, space heating, and ventilation air preheating, and can be used with or without heat pumps. Underground thermal energy storage is used as an energy sink and source when supply and demand for energy do not coincide. UTES may be used on a short-term or long-term basis; as the sole source of energy or as a partial storage; at a temperature useful for direct application or needing upgrade or in combination with a dehumidification system such as desiccant cooling. In California, the Southern California Public Power Authority (SCPPA) signed an agreement with Ice Energy in January 2010 to install 53 MW of Ice Energy technology, which creates ice at night that can be used to provide air conditioning during the peak demand hours of the day. The project, implemented by SCPPA member utilities throughout Southern California, may shift as much as 64 gigawatt hours (GWh) of on-peak electrical consumption to off-peak periods every year. The advanced control capabilities of devices operating within a Smart Grid will make it easier for utilities to implement thermal energy storage systems that may yield more permanent peak demand reductions, as distinguished from demand response programs that yield temporary peak load reductions. Thermal storage installations in hybrid heating/cooling comfort systems will need quite sophisticated building energy management systems (BEMS) in order to realize their full potential. Such systems will encompass both hardware and software items. The thermal inertia of buildings is quite substantial. It will be beneficial from economic and energy conservation points of view, to develop proactive management systems with input from outdoor sensors and local weather forecasts, as well as indoor monitoring data. Energy Conservation - Utilizing new renewable energy sources. Power Conservation - By running energy conversion machines, for instance co-generating plants and heat pumps, on full (optimal) load instead of part load. This reduces power demand and increases efficiency. Reduced Electrical Resistance Heating - Freeing high quality electric energy for industrial value adding purposes. Reduced Energy Imports - The fuel used at night to produce electricity is a domestic resource in most countries, so that less imported fuel is used. Reduced Emissions - This process also has been shown in studies to significantly reduce the emissions associated with producing the power for air conditioners, since inefficient "peaker" plants are replaced by low emission base load facilities in the evening. The plants that produce this power are often more efficient than the gas turbines that provide peaking power during the day. Bad Reputation - In TES' infancy (early 1980s), a small number of manufacturers carefully researched the technology and installed equipment. In the technology's adolescent years (late 1980s and early 1990s), dozens of manufacturers, chasing the new demand-side management rebate incentives, jumped into the marketplace. These difficult adolescent years resulted in tarnished reputations and the spread of misinformation about the technology. No Standard Designs - There are no standard designs of UTES installations. Each facility will be unique to a large extent, even if the basic principles are similar. This means that each installation is more or less “tailor made”, even if components like pumps, pipes, heat exchangers etc. are standard industrial products. There is consequently not a market for UTES as an industrial product in the traditional sense. Airclima, Paris FR - The Ice Spray System is designed to work in the Thermal Energy Storage market. Charging the storage: The coolant is sprayed over the Ice Containers at a temperature below 0°C making ice inside. Discharging the storage: The coolant is sprayed over the Ice Containers at a temperature over 0°C melting ice inside. Cristopia Energy Systems - subsidiary of CIAT group - A French Company with its head office and factory located at Vence, on the French Riviera, near Nice. Their Thermal Storage System (STL) is composed of a tank(s) filled with nodules (balls) and heat transfer fluid. Approximately 60% of the volume of the tank is occupied by the nodules and the remaining 40% is fluid. The heat transfer fluid is usually mono-ethylene glycol. Other brines such as mono-propylene glycol or calcium chloride may also be used. The number of nodules in a system determines both the heat exchange rate between the nodules and the heat transfer fluid and also the total energy stored in the STL. The spherical nodules (balls) are blow moulded from a proprietary blend of polyolefins and filled with PCM (Phase Change Material). 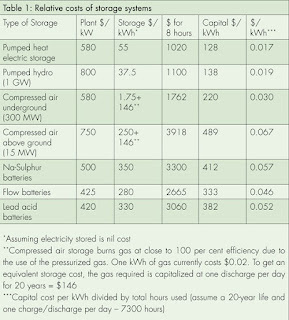 A range of PCMs allow thermal energy to be stored at temperatures between -33°C and +27°C (see table). The nodules are manufactured in two diameter sizes : 77 mm and 98 mm for use respectively at very low phase change temperatures (-18 to –33°C), intermediate phase change temperatures (-3 to –15°C) and conventional building air conditioning ice storage temperature (0°C). A special heat storage nodule with phase change capability at +27°C for use as a heat recovery media is also available. The mechanical and chemical characteristics of the nodule shell are fully adapted to the nodule life conditions. The nodule lifetime is higher than “the equivalent of 20 years of normal utilization”. Indeed, the nodules withstand 10,000 cycles without any breakage. In addition, the polyolefine materials used are completely neutral towards phase change materials (eutectic salts) and heat transfer fluids. Once filled with a phase change material the nodule plug is sealed by an ultrasonic welding machine to ensure a perfect watertight seal. ICAX , London UK- A clean-tech company helping to meet the demand for on-site renewable energy and sustainable development by using inter-seasonal heat stores in the quest for zero carbon buildings. Ice Energy, Windsor CO - The leading provider of distributed energy storage and smart grid solutions for optimizing energy system efficiency. Ice Energy’s smart grid platform integrates the company’s distributed energy storage technology with an advanced software infrastructure and intelligent two-way control that improves integration of intermittent, renewable resources onto the grid. Ice Energy manufactures and markets energy storage solutions, and cooling and refrigeration products for residential and commercial markets. The company offers Ice Bear 30 Hybrid Air Conditioner, an energy storage solution for air conditioning usages in small to medium sized commercial businesses. It offers solutions for architects, building energy consultants, builders and developers, utility customers in California, energy and facilities managers, mechanical contractors, and utilities. Isentropic - Cambridge, UK - Isentropic's Pumped Heat Electricity Storage (PHES) system is based on the First Ericcson cycle and uses a heat pump to store electricity in thermal form. The storage system uses two large containers of gravel, one hot (500C) and one cold (-150C). Electrical power is input to the machine which compresses/expands air to 500C on the hot side and -150C on the cold side. The air is passed through the two piles of gravel, where it gives up its heat/cold to the gravel. In order to regenerate the electricity, the cycle is reversed. The temperature difference is used to run the system as a heat engine. Isentropic's technology is compact, has no geographical constraints and claims a round-trip efficiency of 72 to 80 percent. SolarReserve, Santa Monica CA - Develops utility-scale concentrating solar power plants with integrated molten salt thermal energy storage technology. It was founded in early 2008 by US Renewables Group in partnership with United Technologies Corporation (UTC). UTC's subsidiary Rocketdyne provides and guarantees the performance of the major solar component hardware. Rocketdyne developed the solar receiver for the DOE’s Solar One and Solar Two projects, and has significant technology and operating expertise in extreme heat flux environments (rocket engines) and the use of molten metals (Na and NaK cooled nuclear reactors). In September 2008 SolarReserve raised an additional $140 million in a Series B funding. Google announced in April 2012 that it would use thermal storage to cool the $300 million data center it’s building on 15 hectares of land in Taiwan. The search giant has been experimental in its data center design with everything from seawater cooling to water recycling, and it’s the first time it’s tried thermal storage to cool its power hungry data centers. Google is planning on spending $700 million on building three data centers in Taiwan, and this will be Google’s third data center cluster in Asia after Hong Kong and Singapore. Google will continue to employ green and energy efficient practices at its growing number of data centers under construction throughout the world. 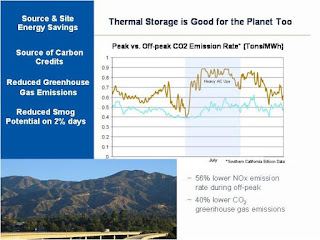 This is the first time Google has used thermal energy storage systems for a data center. At i/o Data Centers’ Phoenix ONE data center, the chillers cool a solution of water and 28 percent glycol. The thermal storage tank contains Cryogel ice balls, 4-inch polyethylene spheres filled with water. The balls freeze when the system is charging at night, and then cool the glycol solution during the day. The glycol solution is then pumped through a heat exchanger, which chills water in a separate loop used in the data center. The first phase of the system provides 12,000 ton hours of thermal storage. A second phase will eventually boost capacity to 24,000 ton hours. Digital Realty Trust’s carrier hotel at 350 East Cermak in Chicago is supported by a thermal storage system featuring an 8.5 million gallon tank of a refrigerated brine-like liquid. The huge tank also supports the Metropolitan Pier and Exposition Authority (MPEA), including the nearby McCormick Place Exposition Center and Hyatt Regency Hotel . The Trigen facility chills the liquid to 32 degrees and pumps it to the nearby buildings, which use it in a heat exchanger system to support their on-site cooling infrastructure. For Digital Realty, that includes a water-and-glycol system and enormous air handlers that deliver chilled air to tenants. The National Petascale Computing Facility (NPCF) at the University of Illinois, which will host the Blue Waters supercomputer, receives chilled water from the University chiller plant and also has outside thermal storage tanks that are cooled approximately 70 percent of the year by mother nature. This is expected to cut the chilled water costs for the facility by about $1 million per year. The National Oceanographic and Atmospheric Administration (NOAA) will bring a new data center online. The facility in Fairmont, West Virginia will support a 383-teraflop supercomputer designed to develop more powerful tools for analyzing the behavior of hurricanes. The NOAA facility is supported by a 32-foot tall thermal storage tank, which holds 25,000 gallons of water chilled at 55 degrees. At full load, the thermal storage will provide about 10 minutes of cooling in the event of a power outage to allow time to restart the chillers. Thanks to author for this post it’s very easy to understand about the storage tank (pressure). Storage tanks are used to store hot and cold water, fuel and oil storage etc. Storage Tank- Manufacturer, Supplier and Exporter of Storage tanks in Delhi, Provides various types of storage tanks like pressure vessel, hot water storage tanks, propane storage tanks, plastic water storage tanks, fuel storage tanks and cold water storage tanks. CS aerotherm Manufacture Batch Ovens, Industrial Ovens, Curing Ovens, Industrial Batch Ovens, PLC automation panel, online Curing Ovens, Tunnel ovens, Custom and Continuous ovens which are used for Drying, Conveyorized Curing and Baking applications for Industrial purposes. I'm researching for my report in class.And were to report something that uses any kind of energy.Thanks for this blog my questions aboutprocess cooling chillers are now answered. This is a great post. I like this topic.This site has lots of advantage. I found many interesting things from this site. It helps me in many ways.